Enjoy a luxurious home away from home with generous West Coast hospitality. 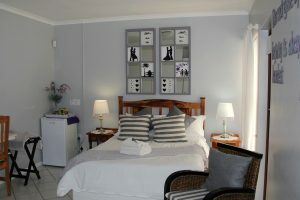 Comfortable stylish guest units are located in Langebaan - in a beautiful and peaceful area next to a golf course. 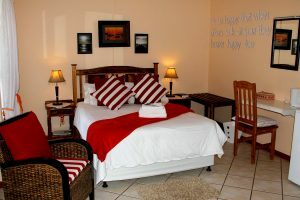 We invite you to come and stay at Makarios guesthouse, situated in Langebaan - the heart of South Africa's exotic west coast. 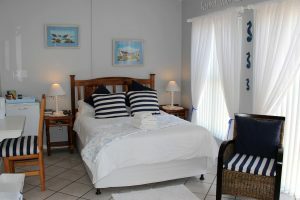 A five minute drive takes you straight to the calm waters of the breathtaking Langebaan lagoon. The lagoon is a paradise for water sports, angling and bathing, with plenty of shops and restaurants. 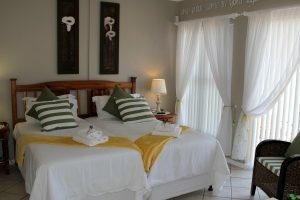 Makarios offers a choice of three luxury double rooms, each with an en-suite shower, and a twin bedded bedroom with en-suite shower. Every unit has a private entrance, a colour TV and tea/coffee facilities. A self-help continental/English breakfast is served on the patio or in the lounge.